What Makes “Weight Management” Dog Food Different? I didn’t notice the change for a long time. It happened gradually. It wasn’t until I came across an old picture that I could really see it. It was a photo of a younger, trimmer version of myself holding a younger, trimmer version of my pup. I then realized both my dog and I had both gotten a little rounder than we were in that photograph. I don’t know how I turned into an overweight girl with an overweight dog. It definitely wasn’t Oreos and Netflix. One obvious way to help your fat dog lose weight is to encourage your pet to move more. If you haven’t gotten around to training your dog to walk on a treadmill or ride around on a skateboard, don’t fret. Spending just a little more time doing simple, everyday activities like running, fetching, or even just rolling around out in the yard (hopefully not eating the grass like mine) off the leash means more burned calories. Playing games like Frisbee or even just throwing around a tennis ball can help you meet your dog’s weight loss goals while having fun with it. Bonus points because it also helps you burn off those Oreos you weren’t eating while you weren’t binging on Netflix. You also have the option to add a bit of light weight to your chubby puppy while they walk or run by using a pack filled with small weights, water bottles, or even packs of pet food. Your best bet will be to talk to your vet if you think your dog is overweight to find out what they think the cause is. Portion control may be the only thing that your paunchy pet needs to lose weight, while a change in the type of food may also help. You not only want to pay attention to the portion size of your dog’s food but also the amount of treats they are given daily if your dog needs to lose weight. I know all too well that treats can be essential for helping with training, especially with dog whistle training. Try to find treats that are tiny in size for this purpose so they aren’t ingesting so much throughout the process. Sometimes it’s also a love thing and you spoil your dog by giving it treats throughout the day for being a good dog. If your pet is overweight, less is best. Instead of loading the dog up on treats, lavish him with attention and praise instead. You can also seek out healthier treat options for chubby dogs. Grain free dog food means just what it says. It’s dog food without grains as ingredients. It is thought that feeding grain-free to the dog helps keep its hunger at bay having it eat less often. It may also give the dog added energy to help them exercise more. A limited ingredient dog food is for dogs that may have sensitivities to some of the ingredients found in most pet foods. They usually exclude ingredients like corn, wheat, dairy, soy, or eggs, leaving an assortment of proteins, carbohydrates, fruits, vegetables, and micronutrients. You can also find limited ingredient combined with grain-free dog food. In low-fat dog foods, the ingredients have lower fat content with more protein than normal dog foods. When buying low-fat dog food, be on the lookout for unhealthy food that may contain preservatives like BHA and BHT, substances that are not natural. They are artificial, unnecessary fillers, items that are leftover from slaughterhouses, vegetable oil, and trimmings of fat. Many dog foods have 30% to some as high as 70% carbohydrate content. Low carb dog food means it has less than 30%, while some of them have as little as 5%-10%. This creates a better protein, fat, and carbohydrate balance for the dog reducing the quantity of starch intake. There are basically two types of weight loss dog foods. For a dog that needs to their weight at the level they are or if the dog is slightly overweight, you want to look at lean or light kinds of dog food to get them down to an ideal body weight. For dogs that are already overweight or obese, reduced-calorie and reduced-fat foods are what you will want to keep your eye open for. Be careful when choosing a type of weight loss diet for your dog. Always read the labels. If you are looking to cut out grains in your dog’s food because of carbohydrates, make sure that the type of dog food you are buying is not supplementing other carbohydrates into the recipe. The bag may read “grain free,” but when looking at the ingredients, they may have added potatoes instead. It is also important to note that grain free and gluten free are not the same thing. Gluten-free products may still contain grains that don’t contain gluten such as rice and cornmeal. When shopping for dog food for an overweight dog, you want to know what it is you are looking for in a weight loss dog food and carefully make the right choice. Know that pricier pet food is not always better than a bargain brand. Search through the ingredients and find out what is being put into the food before feeding it to your dog. According to Suburban Animal Clinic, dry dog food for a light diet should contain no more than 3,100 kcal/kg of food. When buying a wet food in the light type you want the dog food to have 900 kcal/kg or less. If a dog food is marked lean on the package, it doesn’t have over 9% fat in dry food or 4% in wet type. Dog food that is packaged as reduced-fat or reduced-calories must show the percentage of fewer calories or fat that is compared to its regular product. Be on the lookout for fillers in the dog ingredients and know what should or should not be in your dog’s food. Strive for a dog food brand that has more natural ingredients rather than artificial. There are plenty of choices out there in the “weight loss dog food” market. Every person’s situation will be different so check out the ones in our list to see which one will be the right fit for you. Here are the ones that we think are the best for your pooch. Tech Specs – Uses high water binding capacity fibers. What the heck does that mean? It will help the dog feel fuller and not eat so much. Made with L-carnitine for a dog to have more energy throughout the day. Helps your dog have a healthier skin and fur by adding in vitamin A, Biotin, and omega 3 and 6. Good protein sources, and psyllium to help with digestion issues. Overview – Made for dogs that have been spayed or neutered that weight gain may be a concern. Made up of high fiber so your dog feels fuller longer with less dog food eaten. Helps support the digestive system in a dog to assist in avoiding crystals that can later form into stones. Not for severely overweight or obese dogs. What You’ll Like – Helps with the digestive system to not have a build-up of crystals in the dog. The food is filling for the dog so it does not stay hungry when given a small portion. There are no artificial preservatives or colors in this product. Can help a dog’s skin and fur if the dog has mild skin conditions. What You Won’t – The bag is kind of small. Many dog owners disagree with corn or meat by-products being included. You’ll need your vet’s authorization to buy it. Recommendation – I would recommend this brand if you’ve got a dog with a weight problem as well as skin conditions. Tech Specs – High quality with deboned chicken being the first ingredient on the list. Has holistic ingredients incorporated into the dog food. Does not contain any by-product, corn, wheat, or soy and has no artificial flavors or colors. Overview – This dog food has decreased caloric intake to help a dog maintain or reach a weight loss goal. It has a good balance of high protein and good fats that are needed for dogs. All natural without any artificial flavors or coloring. Does not have any chicken by-product. Has Blue’s signature LifeSource Bits to assist a dog to have the right amount of antioxidants, vitamins, and minerals to have a complete balance for all stages of adulthood. What You’ll Like – Great bag size and choices to order from. Great quality of food for the dogs. Natural ingredients that are great for dogs. What You Won’t -There are many recent reviews in the last year stating that the formula may have changed from the original selection. The size, smells, bag quality, and bad reactions from dogs that have eaten this food have been reported. Recommendation – I’d be cautious recommending this dog food. If your vet recommends it, just be sure to watch for changes after they begin the new diet. Tech Specs – First three ingredients are deboned turkey, turkey meal, and chicken meal. Wellness Core Natural Grain Free also has a great assortment of vitamins. Is gluten-free, grain-free, no soy or eggs, and has no artificial flavors or preservatives. Overview – Great source of high protein. A significant amount of vitamins that are needed for dogs are directly in their food. Does not contain any grain and is gluten free for dogs that have sensitive stomachs. The Wellness Core weight management food contains 25% less fat than the original Wellness CORE Original dog food. What You’ll Like – Great natural ingredients for dogs health. Can help with dogs coats becoming healthier and also illuminating mild skin irritation. What You Won’t – High price purchase item. Complaints of the brand making a change and some dogs are becoming ill due to the change. Recommendation – This is a great type of dog food with good fats and quality ingredients. Again, check labels to ensure there haven’t been any changes to this kind of dog food and report any changes of the dog to your vet. Tech Specs – Has brown rice, chicken, and chicken meal as the first three ingredients. There are not any artificial flavors or colors. 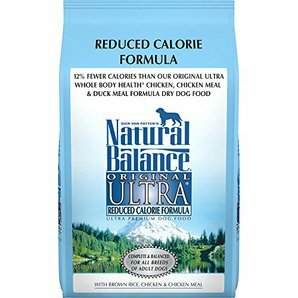 The Natural Balance weight loss dog food contains 12% fewer calories than the original Natural Balance dog food. Overview – A great choice for dogs that may be overweight, a senior, or less active than the usual dog. This is a great all natural dog food to help a dog maintain their weight or lose a few pounds if they need to. I would not recommend this dog food for an obese dog. What You’ll Like – I like how the dog food has natural ingredients and is suitable for dogs that are using fewer calories in their daily lives. What You Won’t – Great food but some dogs may not like the taste and will refuse to eat it. Recommendation – I recommend this type of dog food for dogs that do not have an active lifestyle, need to maintain weight, or they are elderly. Tech Specs – Made with simple ingredients starting with chicken, chicken meal, and turkey meal. Pertaining to dogs that may have sensitive stomach issues. Whole foods were used in the ingredients. Overview – A healthy choice for dog food. This grain free weight control dog food is clearly labeled and wholesome for dogs of all ages. Helps with dogs that may have sensitivities with other dog foods. What You’ll Like – Naturally made dog food with great ingredients in a dog food. What You Won’t – May take the dog a while to become use to the taste of this dog food. Some feel that the price is high for the volume. Recommendation -A great healthy natural source of protein and low fat to help a dog maintain and lose weight. Would probably be best for small breeds due to the price. Tech Specs – Is made with pasture-raised lamb as the first ingredient. Made with live probiotics specifically tailored to a dog’s digestive system. Has an assortment of vegetables, fruits, added vitamins and minerals, and natural antioxidants. To help strengthen a dog’s skin and fur Diamond Naturals Light contains omega fatty acids. Overview – A great blend of natural ingredients to help a dog with problems it may have losing weight. It targets a variety of different concerns a dog may have like weight and digestion sensitivity. Great balance of fat, protein, and carbohydrates that are just right for a dog to lose weight. What You’ll Like – Made with natural ingredients set to help a dog that may have other troubles besides needing to lose weight. Can help keep a dog’s flatulence at bay if that is a concern. What You Won’t – Some dogs may not like how this food tastes if they have had other types of dog food to compare to. Recommendation – I would use this for a dog that may have other concerns along with needing to be on a diet. 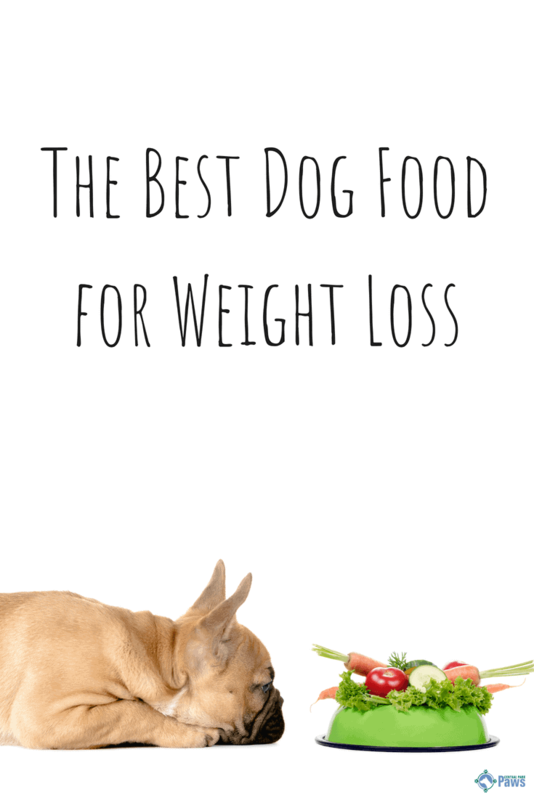 Overall, I would say that this is the best dog food for weight loss. Tech Specs – Use of avocado as the main ingredient. Is wheat free, corn free and soy free for dogs that may have sensitivities to those ingredients. Does not have by-product meals or artificial flavors, colors, or preservatives. Overview – A food focused on the use of avocados as a major ingredient. Uses California avocados to promote dogs to have great skin, fur, and health. Low in fat and high in protein for dog’s to lose and maintain weight. What You’ll Like – Helps with certain skin conditions that some dogs may have. What You Won’t – Some dogs can have reactions to this dog food causing itching and diarrhea. Uses grains as the first ingredients. Recommendation – This is a great product to help with weight loss while keeping high protein in the dog. Tech Specs – Does not have artificial colors, flavors, or preservatives. Has antioxidants to help a dog with their immunity. Made with chicken as the first ingredient. Overview – Scientific studies were collected with 70% of the dogs losing weight within the first 10 weeks of using this dog food (while Hill’s states this fact all over their website – and many other bloggers parrot it – I cannot, for the life of me, find the actual study they used). Can help your dog lose weight with natural ingredients. Great for dogs that are not as active, neutered, or have a higher chance of weight gain. What You’ll Like – Chicken is the first ingredient. Natural ingredients followed by studies to see how they work. What You Won’t – Contains whole grain corn, corn gluten meal, and powdered cellulose that some dogs may be sensitive to. Recommendation – I would give this dog food a try as long as your dog does not have sensitivities to the ingredients. Great for larger breeds due to the low price. Tech Specs – Does not have any wheat, soy, or artificial preservatives. 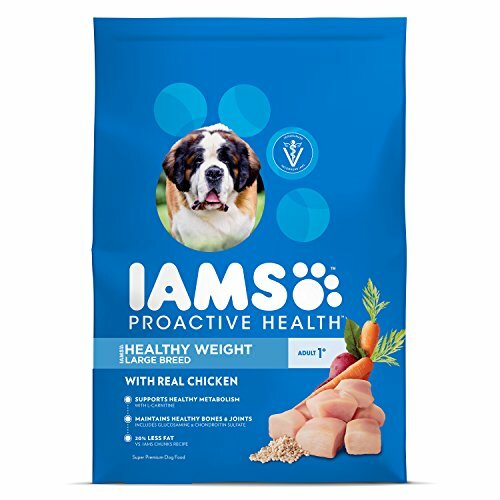 The IAMS Weight Control food has 20% less fat in it than the IAMS chunks original. Uses L-Carnitine to help dogs have a better metabolism. Glucosamine and chondroitin are some ingredients that will help the dog have healthy bones and joints. This is for large breed dogs that need to lose weight. Overview – Does not have all natural ingredients. The first three ingredients are ground whole grain corn, chicken by-product meal, and ground whole grain sorghum. This food may not work for a dog that has a sensitive stomach or problems with grains or eggs. What You’ll Like – That it is made for large breeds to help lose weight. Pet parents and dogs seem to like this brand and it helps the dogs lose weight and keep the weight off. What You Won’t – The ingredients are not 100% natural and the first ingredient is not a type of meat but mainly fillers. Tech Specs – Has a combination of three types of meat, chicken being the first ingredient, lamb, and salmon. 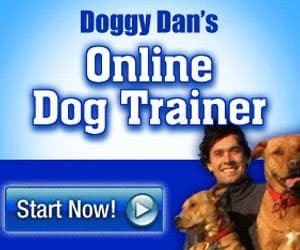 Is created for overweight adult dogs for a healthy weight management. Does not incorporate any chicken by-product meal, corn, soy, or wheat. This dog food does not have any artificial flavors, colors, or preservatives. Does not have any GMO. Overview – Great product that can be used across the board with any size animals. Incorporates healthy superfoods such as coconut, chia, kale, and blueberries. Chicken is the first ingredient, followed by chicken meal and whole brown rice. Great source of protein with balanced fats. What You’ll Like – I like how it has meat variety where most dog foods only have one type this one has three. Dogs are very satisfied with this dog food. Has a broad range for most dogs to use. What You Won’t – The smaller dog breed bags are smaller than the normal size bags. 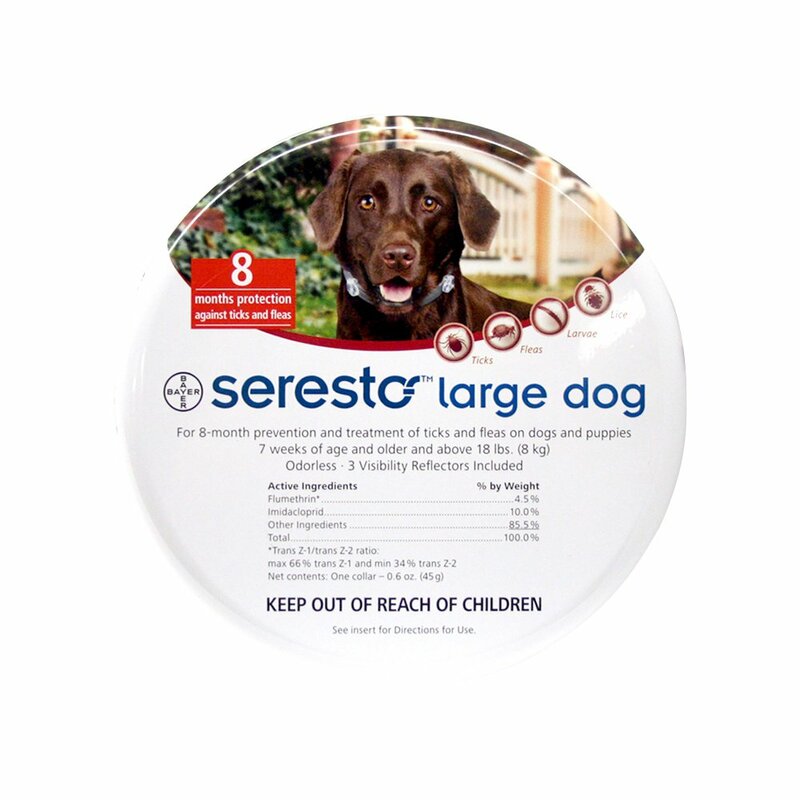 Recommendation – This is a good product that is well balanced for all types of dogs to help with weight management. It is best to talk with your veterinarian before switching dog food and decide together what is the healthiest option for your overweight dog’s nutritional needs. My top choice would be Diamond Naturals LIGHT for a normal diet. 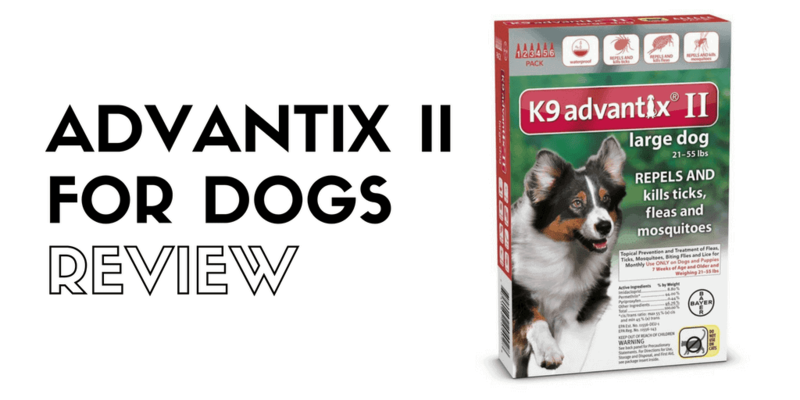 This dog food is great for meeting all of the needs to satisfy the dog’s diet while also adding extra healthier options for the dog’s digestion. Another top choice is CANIDAE Grain Free PURE if the dog has a sensitive digestion system and needs to lose weight. I would recommend NUTRO ULTRA Weight Management for a house with multiple dog breeds needing to maintain or loose some weight, like mine. Just gotta find myself some diet Oreos and we’ll all be set. What’s the Best Dog Food for Goldendoodles? Copyright 2019 by Central Park Paws.